Three minutes and 59 seconds. That’s all the time it took for spoken-word artist and activist Roxanna Azari ’10 to get a standing ovation from the room full of diplomats at a recent United Nations event in which she performed the piece she wrote based on the UN’s work to engage youths as changemakers in the pursuit of peace and security and the prevention of violence and extremism. Azari, the founder of Wheaton’s iSpeak and a 2010 Thomas J. Watson Fellow, consults on issues of diversity and inclusion for companies, in addition to performing and running workshops nationwide for middle school, high school and college students. She was invited to speak at the UN through Create 2030, an initiative that engages artists in carrying out the UN’s set of 17 sustainable development goals. 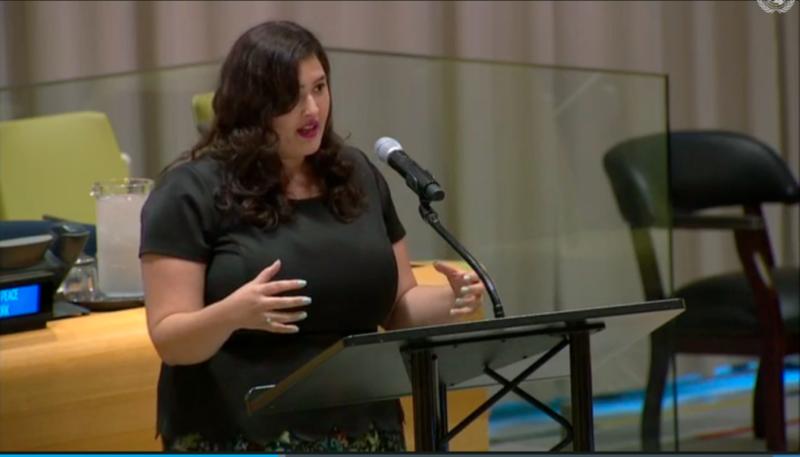 She presented her poem, “Framing Violence,” on September 28 during the launch of the full report of “The Missing Peace: Independent Progress Study on Youth, Peace and Security” at the 73rd session of the General Assembly at the United Nations Headquarters in New York City. The event was part of the kickoff of the UN Youth Strategy. UN Secretary-General Envoy to Youth Jayathma Wickramanayake introduced Azari with a, “Roxy, I hope you can wake up this room,” and the poet stood at a podium with all eyes on her and delivered a message about the power in the names we give others. “My poem focused on the dangers of homogenous gendered narratives of calling youth in conflict areas ‘savages,’ ‘uncivilized,’ ‘violent’ and/or ‘oppressed,’ ‘silent,’ and discussed how we use these narratives to justify violent policies against youth when, in fact, there are so many young people around the world actively attempting to change and fight systemic violence, while creating peace in their communities,” said Azari, who double majored in women’s studies and English and now is an adjunct lecturer at Hunter College in the women’s and gender studies department. “The poem I wrote was almost like a retelling of the report in my own words. So much of the report was directly related to concepts I teach in my own classroom regarding pressing issues. I also write and teach a great deal around the fact that we often omit and/or ignore the roots of systemic inequities, which I felt was very related to the study. Why don’t we hear these stories? How can we create policies without hearing from the voices they affect?